In need of entertainment for the big kids? If so please take a look above at our 15X17 family inflatable. This bouncy castle has extra high walls for adult safety and comes complete with a shower cover. Football Fans will enjoy a bounce on this one with attractive theme. This bouncy castle will not fit most gardens, so we advise you measure the area before booking. This inflatable is suitable for children and adults. The Bouncy Castle is 15FT X 17FT although ensue you have at least 17FT X 19FT to accommodate the unit safely . 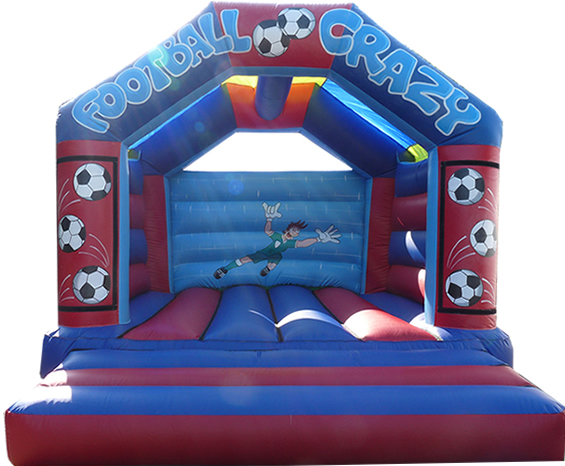 Please note you are booking Football Crazy from Castle Empire Bouncy Castle Hire Manchester.